Emma Blinn, left, and other Stephen F. Austin State University students, recently volunteered at the Family Fun Night event at the Greater East Texas Community Action Program Head Start. This collaborative event between SFA and GETCAP Head Start provides students with the opportunity to engage with and learn from community members and leaders from diverse cultural backgrounds. 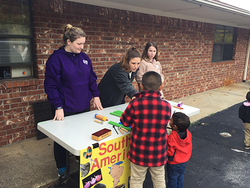 NACOGDOCHES, Texas - Situated by the South America music table, Stephen F. Austin State University student Emma Blinn watches as children explore diverse cultures through playing with different musical instruments. "It was so amazing to see the kids figure out how each instrument worked. This truly gave me a first encounter on how children absorb the world around them," Blinn said. "There is something really special about seeing their curiosity come alive, even if it is just over a little xylophone." "Family Fun Night was really special because I got the chance to experience the family dynamics, sibling interactions and the overall atmosphere of Head Start," Blinn said. "This heavily relates to my nursing field of study because it has shown me what type of approach I should take when it comes to speaking with this age group and helping them understand." Dr. Flora Farago, assistant professor in SFA's human development and family studies program, explained how this collaborative event provides SFA students with the opportunity to engage with and learn from community members and leaders from diverse cultural backgrounds. Farago said it also provides students with a way to support local agencies serving children and families. "These experiences are mutually beneficial to our students, community members and agencies serving the Nacogdoches community," Farago said.